There is a new culinary creation being test marketed in the American midwest that contains a secret sauce between slices of Pepperjack Cheese and Swiss Cheese topped by two slices of bacon and with two filets of fried chicken that serve as the "buns" of the "burger." Called the Double Down, this one meal is estimated to supply 124% of the recommended daily allowance of fat; 117% of saturated fat; 105% of cholesterol; 125% of sodium; 194% of protein; and a relatively modest 61% of your recommended daily calorie intake. The Colonel is out to kill you. 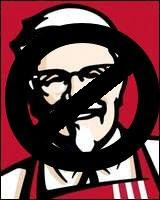 [I]f our figures hold true, and KFC won't confirm they don't, the Double Down is more caloriffic than the Wendy's Triple with Everything and Cheese (1700 mg sodium, 960 calories, 26 gms of fat), the Burger King Stacker Quad (1770 sodium, 1020 calories, 69 gms of fat), and compares closely to the fat, salt and calorie totals of three McDonalds Big Macs put together (3060 sodium, 1620 calories, 87 gms fat). It's merely another escalation in an ongoing war among fast food purveyors to create the most outrageously over-the-top bad nutrition in the world. In the US, nothing succeeds like excess. Wow - that Double Down is scary. I glanced at the picture and I don't think it looks particularly appetizing. That's probably just as well - I'm pretty sure I don't need to eat one of those things. Ever. The question is: if you ate one would you need to eat anthing else. Ever.